When it comes to comparing online waiver systems, it pays to do your homework. Although each waiver app has similarities, there are also major differences. When it comes to comparing online waiver systems, it pays to do your homework. Although each waiver app has similarities, there are also major differences. Today we look at three of the most popular platforms – Smartwaiver, Waiver Master, Waiverfile and WaiverForever – to see what each has to offer. Online waivers allow your customers to quickly and easily sign electronic forms from any internet connected device – computers, smartphones or tablets. These online waiver applications remove the hassle of dealing with paper copies and (most) include built-in analytics to analyze customer behavior. All four of our reviewed products have many of the same basic features. We’re talking commonalities like cloud-based infrastructures, web and mobile apps to complete transactions, and downloadable copies of waiver forms for reference or archive purposes. 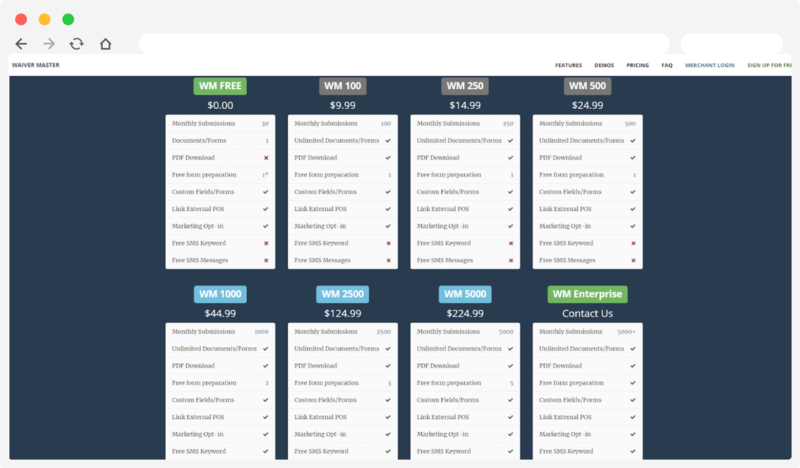 These systems also feature advanced options such as group signing and tracking, custom URLs for text or email broadcasts, photo capture, and integrations with several popular email and CRM platforms. Yet, the main area where these programs differ is arguably the most important – the process of creating your online forms. To explain, let’s see how each of the four vendors handles this critical task. To start our online waiver comparison, we begin with Smartwaiver – a well-known name in the online document space. Started in 2012, the Oregon-based Smartwaiver claims to have processed over 40 million waivers in the last six years. With that kind of volume, it’s worth looking under the hood to see what’s going on. 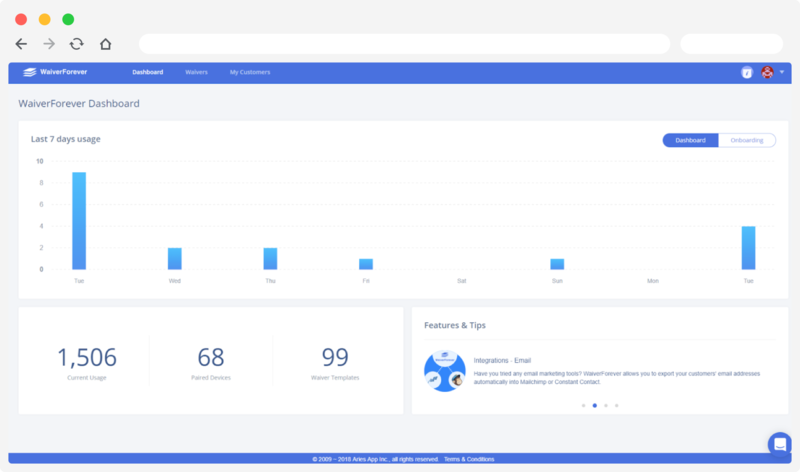 Logging into our portal, we were greeted with a clean, yet somewhat sparse dashboard. After clicking on the menu button at the top left of the screen, we found the button to create our first waiver. 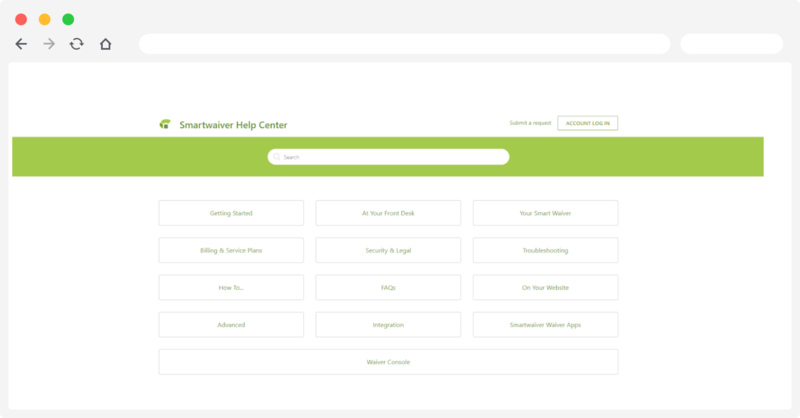 As you step through the process, Smartwaiver displays a series of screens with formattable text areas, optional checkboxes, and customizable waiver fields. While most everything needed to create a solid online waiver is included, it’s a bit frustrating having to go through so many screens to get there. Especially when you have to go back and forth between screens to change your input. And if you want to revise/edit your waiver after it’s done? You’ll need to walk back through the entire process all over again. Contrast this with the creation process from Waiver Master and you’ve got an entirely different animal. That’s because Waiver Master makes you submit your existing document to them and they create the online waiver for you. Their website says that most requests are completed within 24 hours but could take longer depending on the complexity and file format of the waiver. There’s also a one-time fee that ranges from $10 – $25 for each document submitted. Again, this varies based on how difficult the corresponding form is to create. If you already have paper copies of your existing waivers – and don’t mind paying the fee to transition to digital – then Waiver Master might be a contender. However, if you anticipate creating new online waivers (or modifying existing ones), then you may want to think twice before signing up. Next up is Waiverfile – yet another online waiver solution. Waiverfile differs from its counterparts in that it’s completely web-based and doesn’t use apps on iOS or Android devices. Waivers are shared directly through a custom URL (which can be viewed on any compatible browser). The program offers a clean interface with the menu bar on the left and form builder on the right. Creating a new waiver is fairly straightforward and is accomplished by following the included prompts. Administrators are presented with a mix of existing text blocks (for standard info) and customizable data fields which can be tailored to their needs. Program resources allow you to create most whatever type of online form you’d want. 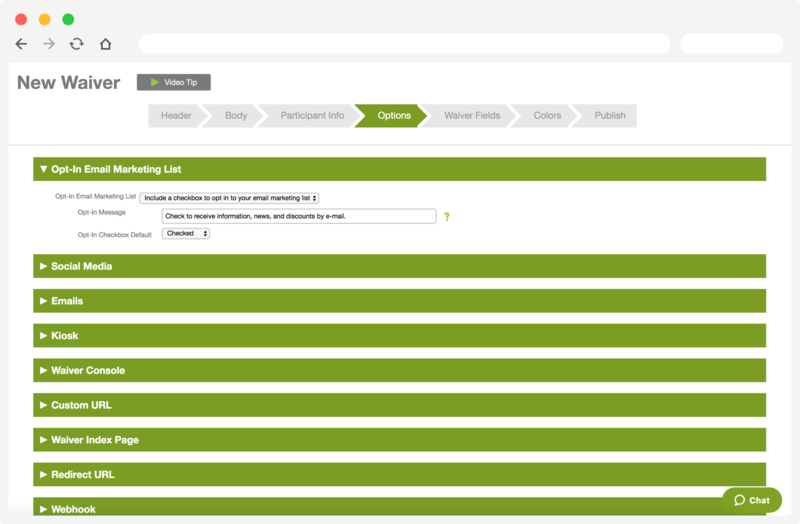 However, you still need to step through all the prompts to get a preview of what your completed form looks like. The main drawback is that – since there’s no offline functionality – you won’t be able to use the program without an internet connection. Which could be a deal breaker for collecting waivers offsite. 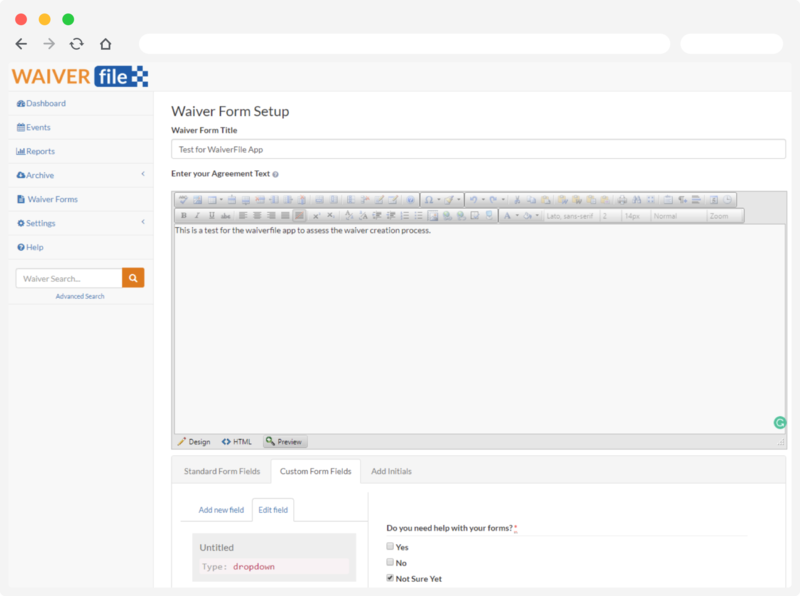 Waiverfile’s form builder is a considerable improvement over Smartwaiver and Waiver Master, but the options for a single-entry data screen, live preview, and offline access would make it even better. 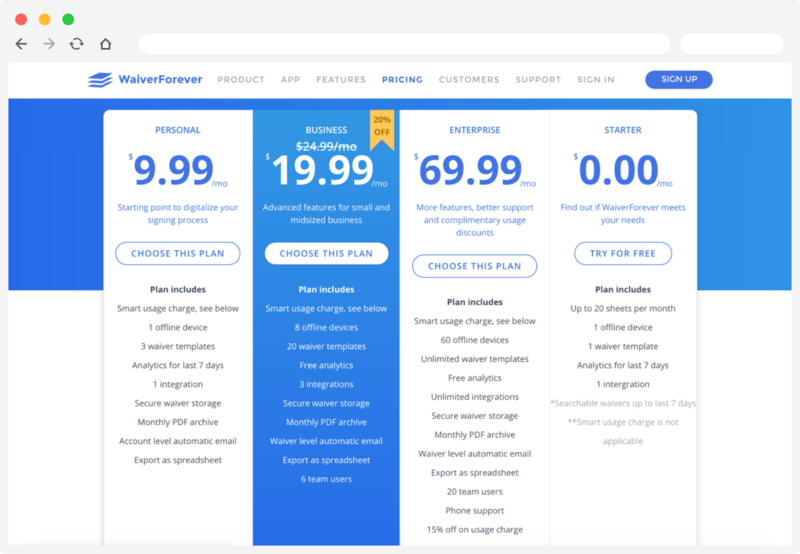 The last provider in our test is WaiverForever – a vendor with over 16,000 customers and 7 million+ online waivers processed to date. The first thing you’ll notice about WaiverForever is that they have a unique method for creating online waivers. 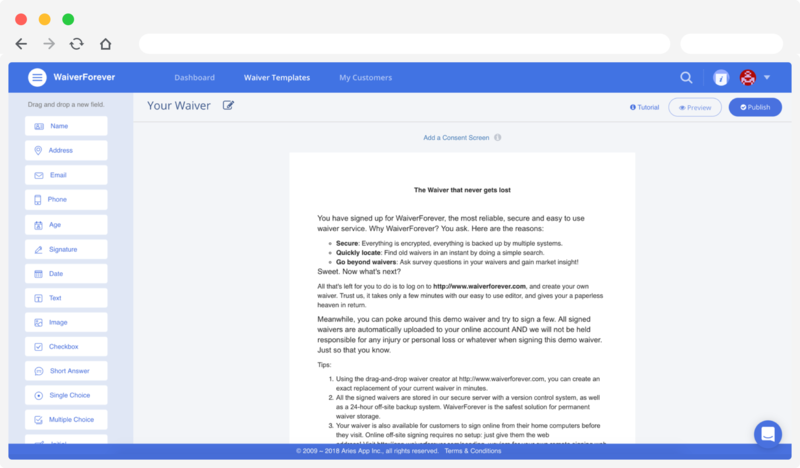 Rather than click through page after page of options (like Smartwaiver) or must wait in line to get your form built (as with Waiver Master), WaiverForever uses an intuitive drag and drop interface that makes creating waivers a breeze. Simply grab the field you want from the menu (name, address, email, etc.) then move to where it needs to go. Not only can you easily add and edit data fields on the fly, but you get a design preview at the same time. The WaiverForever interface makes building online forms a fast and easy process. It goes without saying that your chosen template builder should be both powerful and efficient. But what happens when you experience problems or have questions about your account? We ran an online waiver product support comparison to find out. Again, we start with Smartwaiver and find that the results are positive. Their support page has a large knowledge base of articles to choose from. And a quick jump over to their contact page reveals a phone number and an email address to use for help. Smartwaiver also has a demo video and a free trial option – so you can try before you buy. Nothing to complain about here, so we move on to Waiver Master to see how they stack up. 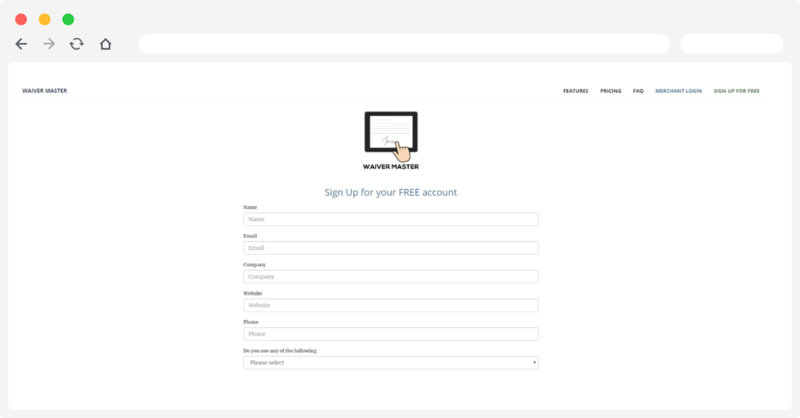 Waiver Master also has a free account and demo forms to test drive the service, but support options are a bit more limited. We couldn’t find a contact number anywhere on the site and the only place an email address is visible is on their FAQ page. You can’t even log into the service until they create your first waiver and provide access credentials afterward. Which makes it hard to assess what you’re getting without at least a small upfront commitment. In all fairness, the Waiver Master support level is likely better with a paid subscription. But it still seems odd to not have visible contact info for interested buyers. Our third contender is Waiverfile and support is one area in which they shine. 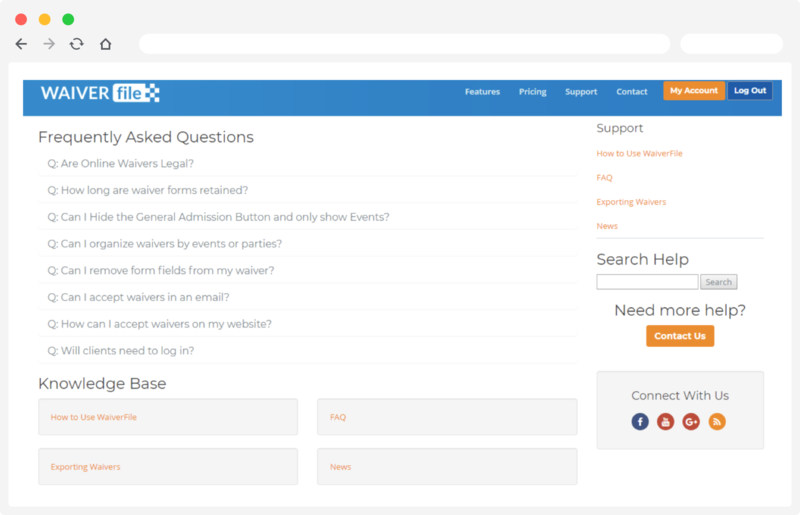 Their contact page has multiple support options including phone, email, and chat. They also list their business hours, so you know when a live support agent is available. Waiverfile also provides a setup video and free 30-day trial to test drive the app before signing up. Their knowledge base and product videos are thorough and well-organized. Providing an overall pleasant experience for users. Finally, we arrive at WaiverForever. As is the case with others, you’ll find a free trial, explainer video, and a robust knowledge base to answer common questions. Although you must log into your account dashboard to access it, the popular messaging/chat app Intercom is available for trouble tickets and product support. The team says that any messages received are answered within one business day (or less). Should you need additional support, there’s a link near the top of the site homepage that can be used to schedule a call. It’s safe to say there are more than enough options to satisfy most users. A head-to-head matchup wouldn’t be complete without examining the pricing structure for each of the contestants. Although you’d think this would be an easy comparison, that’s not exactly the case. Because some products are customizable based on the user’s needs and anticipated waiver volume. For Smartwaiver, all plan features are included in each package. Pricing differs based solely on the tier of service needed (which equates to the number of waivers processed each month). Simply put, the more you grow the more you pay. Smartwaiver Pricing: It’s nice to know that everything is included in each package. But the monthly premiums can really add up as your business continues to grow. 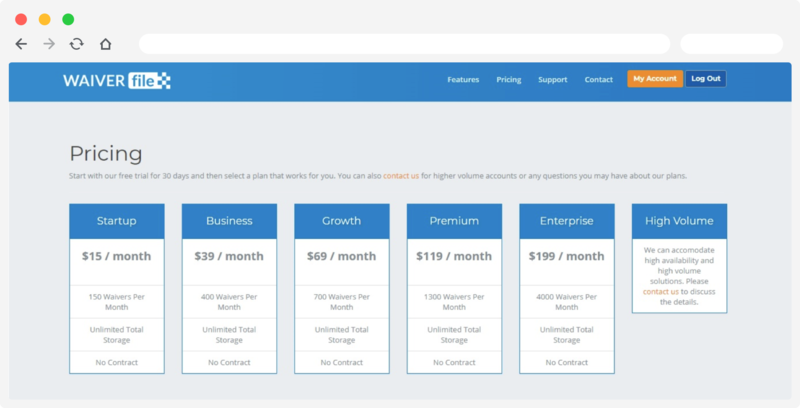 Waiver Master has a more varied approach to pricing. Different service features are added as you move through the higher volume waiver plans. For instance, PDF downloads are included in every package beyond the intro tier. However, you won’t get access to free SMS Keywords and Messages until signing up for the WM1000 plan. Waiver Master Pricing Plan: The per waiver cost is considerably less than what you’d pay for a comparable Smartwaiver plan. But, on the other hand, you may be getting fewer features overall. Waiverfile is next up to the plate. Their pricing plans fall somewhere in the middle of the pack based on others. Less per page than Smartwaiver, but more than Waiver Master. 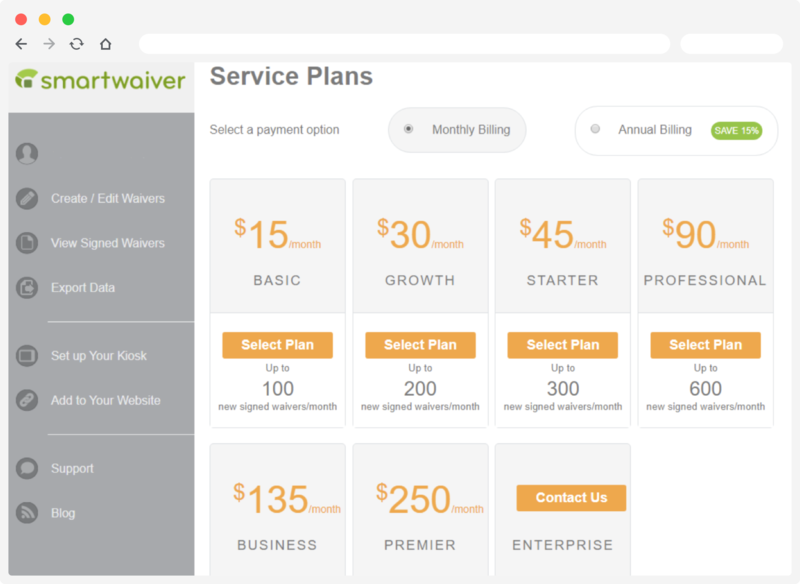 Waiverfile Pricing: For example, Waiverfile’s “Business” plan (400 waivers/$39 per month) would run $90 for Smartwaiver’s comparable plan but only $24.99 for Waiver Master’s WM500 tier. A big benefit with Waiverfile is that all features are included and there are no long-term contracts. Finally, we come to WaiverForever. The best way to describe their pricing model is to say it’s a “hybrid” of the other three styles. You have different features included in each of their four packages. Yet, the cost per waiver is completely independent of the service options that you choose. WaiverForever Packaging Pricing: While this may seem confusing at first, the model can actually be better in the long run. For example, you might have only one or two templates you normally use, but your company processes 300 or more waivers each month. In this case, you could sign up for the WaiverForever Personal plan at $9.99 per month and add 300 waivers for an additional $25. That brings your total monthly fees to $34.99. WaiverForever Data Fees: However, the same number of transactions with Waiver Master would put you in their starter plan at $45 per month. Or the reverse could be true. You may need additional program features (like up to 6 team members) but process less than 100 sheets per month. This would allow you to grab WaiverForever’s Business package and include a modest usage fee of just $5 per month. Putting your grand total at $24.99 each payment cycle. A solid value considering everything that’s included. 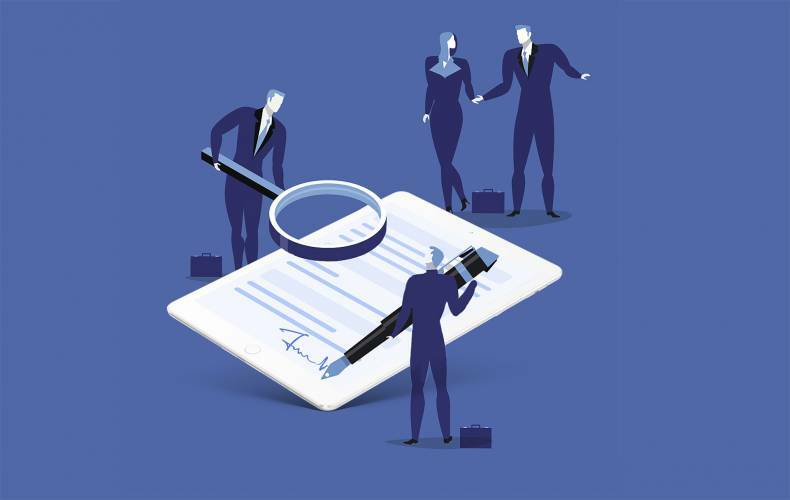 Although the main purpose of online waivers is to provide convenient legal compliance, they can also be a great marketing tool. Capturing user info for analytics, spotting customer trends, and identifying possible opportunities. Thus, a comparison of system integrations only makes sense. Smartwaiver includes email support for MailChimp, Constant Contact, ContactOut and Emma. The app also has plugins for numerous third-party reservation and membership systems. A big perk if your organization already uses these programs. But a less important consideration if you don’t. 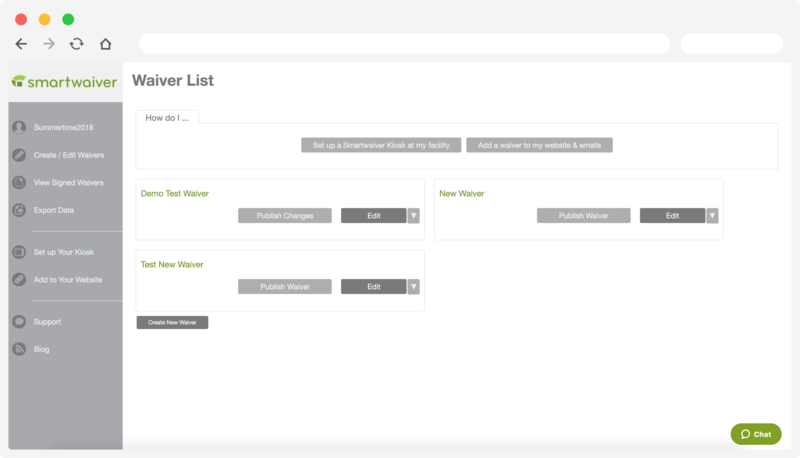 Waiver Master integrates with Clover, Square, and MindBody. As with Smartwaiver, these payment service providers are great if you’re already utilizing them for your business. However, if you’re not, they likely won’t impact your buying decision. There’s no mention of any type of email integration on the Waiver Master website. Waiverfile: had a strong showing in most other comparison tests, but the app is somewhat limited when it comes to integrations. The only syncing options are MailChimp and Constant Contact for email and Signpost for CRM building. WaiverForever has the same email options with MailChimp and Constant Contact but also syncs with the highly-popular integration and automation service Zapier. Having Zapier integration is a major bonus because it allows you to connect with over 1,000 online services such as Google Sheets, Airtable, HubSpot CRM and many others. This element alone opens a realm of possibilities for how data can be processed. So, while most of these waiver products had similar options for email marketing, the main difference was support for third-party applications. Smartwaiver (natively) had more than any other, but WaiverForever’s Zapier integration proved to be the game changer that put them on top. Reading about a product on their website is one thing but seeing actual customer reviews is another. Thus, for our final challenge, we decided to gather feedback on all three apps from the people who use them every day. And the results were surprising. While Smartwaiver reports having over 40 million completed transactions, there was only one review on the App Store and zero on Google Play. Waiver Master fared slightly better with nine reviews for Apple products and one for Android devices. Comparing reviews for Waiverfile is a bit more difficult as there is no mobile app for iOS or Android. Thus, there’s no feedback available on either the App Store or Google Play. To be fair, there were a handful of favorable reviews on the software evaluation site Capterra. But the number of respondents was only three. But the clear winner here was WaiverForever. Their mobile app clocked in an encouraging 56 App Store reviews with an average rating of 4½ stars. And Google Play scored well also with 57 reviews again averaging near 4½ stars. A lopsided victory for WaiverForever (to say the least). So, who takes the crown in the online waiver wars? Well, it depends. For businesses looking to outsource their waiver creation – and don’t mind waiting or paying extra to have it done – Waiver Master makes sense. If, on the other hand, you need all the additional bells and whistles for low volume transactions, Smartwaiver could be the answer. If your needs are somewhere in the middle, and you don’t require many third-party integrations, then Waiverfile is a contender. However, if you want the most user-friendly waiver creation tool, multiple support options, and an affordable price, then WaiverForever is the logical choice. In the end, online waivers are a critical part of securing and growing your business. Take your time when shopping to ensure you choose the one that best suits your needs and allows for further growth. Otherwise, you could find yourself starting back at square one.